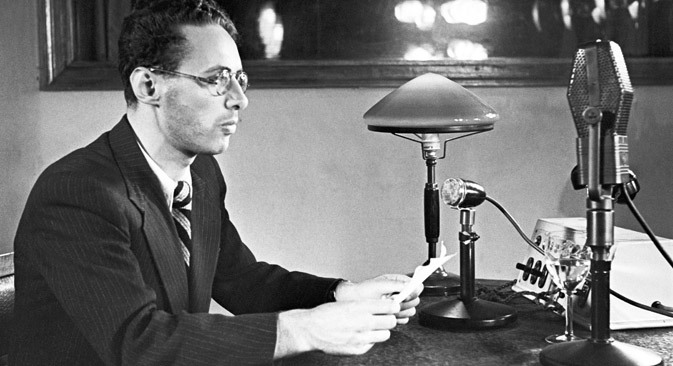 Thanks to a personal intervention by Joseph Stalin, radio newsreader Yury Levitan rose from humble beginnings to national adulation in the space of several short years. Levitan announced the most important events in the USSR for almost 50 years, becoming immortalized in the Soviet Union for the words “Moscow is speaking,” with which he always began his broadcasts. When a young aspiring actor by the name of Yury Levitan took up work as a radio announcer in Moscow in the early 1930s after being rejected by the theatrical institute because of his provincial patois, nobody could have foreseen that this man was destined to become a household name across the USSR and one of the most iconic voices in Soviet history. Levitan, the son of a tailor and a housewife, had come to Moscow from the nearby city of Vladimir after finishing nine grades of school, hoping to make his career in acting. After the theatrical institute refused to enrol him, he was admitted to a group of radio announcers selected by renowned actor Vasily Kachalov – and then fate took over. In January 1934, after hearing the young broadcaster’s voice on the air, Stalin phoned the Radio Committee and demanded that from now on only Levitan read his reports. Thus the young intern, thanks to the rare and expressive timbre of his voice, became the main radio anchor of the Soviet Union. On the morning of June 22, 1941, the phone at the Radio Committee was ringing off the hook due to calls from correspondents in Kiev and Minsk reporting the unexpected attack on the Soviet Union by Nazi Germany. Moscow was afraid that the reports were a provocation, but Levitan was called to work just in case. Shortly a courier brought a package from the Kremlin containing a piece of paper with two lines that had to be broadcast: "At 12 o'clock an important government announcement will be made." "Attention! Moscow is speaking! Citizens of the Soviet Union! We are transmitting an announcement from the Soviet government. Today at four o'clock in the morning, without presenting any claims to the Soviet Union, without declaring war, German forces invaded our country…" announced Yury Levitan, beginning four years of regular broadcasts on the progress of the Red Army in its struggle to push back the Nazis. From the fall of 1941 onward, Levitan pronounced the words "Moscow is speaking" from Sverdlovsk (modern-day Yekaterinburg), around 900 miles (1,400 km) east of Moscow. This was due to the fact that all Moscow’s radio towers had been dismantled, since the Germans had been using them as targets for their bombardments. Levitan received instructions from his commander-in-chief and reports from the Soviet Information Bureau in Moscow by phone. In March 1943 the newsreader was transferred to Kuibyshev (now Samara), 540 miles (870 km) southeast of Moscow, where the Radio Committee was located. But up to the end of the war everyone was convinced that his voice was coming from the capital: The fact that Levitan was announcing from Sverdlovsk was divulged only a quarter of a century later. On May 9, 1945 Levitan was called to the Kremlin, where he was presented with the Commander-in-chief's text on the allied victory over Germany. He had 35 minutes to prepare. In order to make it to the studio he had to cross Red Square, which was flooded with people. Levitan would later remember that he had to scream (his recollections are mentioned in an essay by Levitan's friend and publicist Yury Belkin – RBTH): "Comrades, let us through, we have important things to do!" And the people shouted back: "What things! Levitan is about to announce the victory. Stay put like everyone else and listen!" He immediately returned to the Kremlin, which had its own radio station. At 12:55 Levitan removed the wax seal from the envelope and read: "Moscow is speaking! Fascist Germany is destroyed!" During the war years, between 1941 and 1945, Levitan read around 2,000 reports in total from the Soviet Information Bureau. The reports were not recorded at the time and Levitan was later asked to record part of the announcements on tape in the 1950s, for posterity. Levitan died from a heart attack in 1983, in Prokhorovka, during commemorations of the Battle of Kursk. He had first experienced heart problems in the middle of 1945, while reading material about Auschwitz on the air. In those 28 years the first anchor of "all Soviet radio stations" had managed to read many more government announcements and reports from Red Square, as well as tell the whole world about man's first space flight in April 1961.